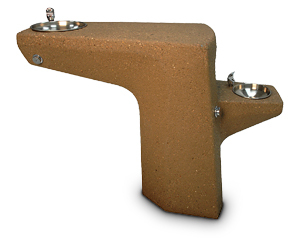 Dual Height Drinking Fountain, Great for Kids! Now kids can reach the drinking fountain spout and quench their thirst just like the adults! Featuring two handicap accessible spouts and bowls, the taller arm is the perfect height for adults while the lower one is specially designed to be easy to reach for children. Great for parks, playgrounds, and sports fields. Made with reinforced 1/4" steel rebar and Portland cement ASTM C 150. Available in your choice of Exposed Aggregate or Weatherstone finish in a variety of concrete colors. Plumbing included. Unit arrives fully assembled. 'You design it' Recycled Ground Glass Concrete Finish (qualifies for LEED® points). Easy 3 step ordering process. * 'Clear, Amber, & Charcoal' color options available with model numbers ending with '-CUS4'. ◊ 'Emerald & Blue' color options available with model numbers ending with '-CUS7'.